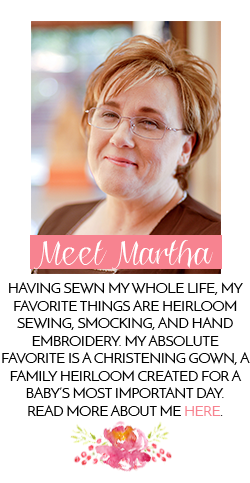 Southern Matriarch: Dare I Say It? .......Easter! Yes, even if all of your Christmas decorations are not put away (who me?) it is time to start thinking about Easter. 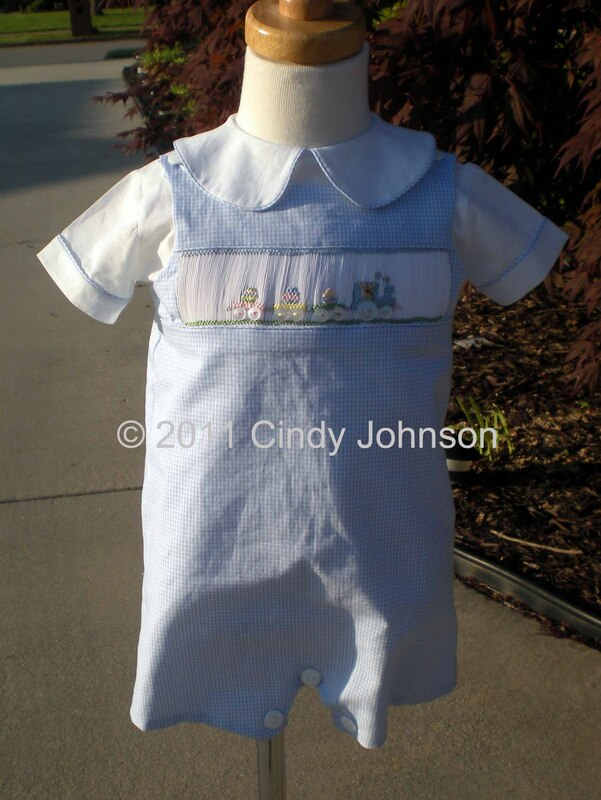 If you have more than one to sew for, they live far away, you want to have portraits done, or you have other larger projects (think christening gown) that need to be accomplished or like me, all of the above; NOW is the time. So what are you thinking of for Easter, faithful reader? I think Peter Cottontail may be hopping down our bunny trail again this year. He might need some modifications to use in the way I want to, but he is a definite front runner. Princess LOVES Beatrix Potter and has the complete set of little books that she pours over again and again. Her favorite is Timmy Tiptoes and Jeremy Fischer. 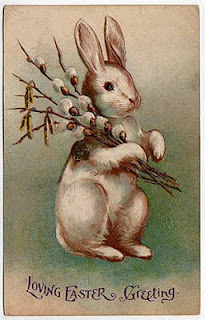 What Easter bunnies are you planning? Cindy over at Sew Blessed posted this cutie a couple of years ago. So cute. Michie' posted this one, also a couple of Easters ago. I love these bunnies as well. 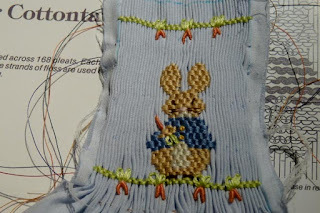 This was posted by Gwen Milner, who actually designed the Peter Cottontail I plan to use. These are just a couple of bunny plates. There are many, many more. More than I have enough Easters to smock. I would love to hear what you are planning. For now, I am off to the sewing room. I will get to those Christmas boxes tomorrow. And in case you weren't stressed over Easter being only 80 days away, here is a little more to fuel the fire. Yes, it is definitely time to plan those Easter projects, or they will not be completed in time. Easter eggs and hot cross buns are already in the shops here. Ridiculous!!! We still have Australia Day, Chinese New Year, Shrove Tuesday, and Valentines Day to deal with as well as the school year starting and university courses getting under way before Easter arrives. Do you know where I could find the bunny template by Gwen Milner? I am sorry, I do not know how to obtain the Emma's Easter Bunny Garden. If you post a reply on Gwen's blog she may be able to better answer. Her blog post about the bunny plate is listed under the photo. Thank you. I will do! 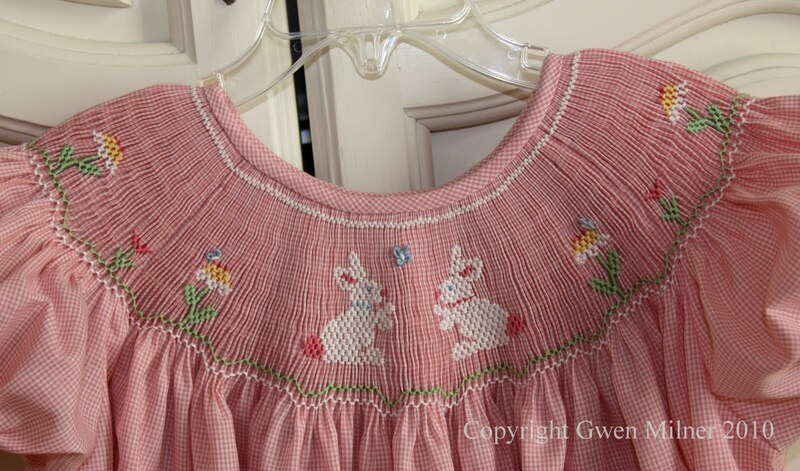 I also would like to know where to find Gwen Milner's bunny smocking plate. It is no longer downloadable from her blog, or is it forsale anywhere that I know of or can find. Thank you! As I told Joanne, no I do not know where to get that Easter Bunny plate. If you follow the link to Gwen's blog and post a reply on that blog post she may be able to help you. Good luck! Yes, it's time, I use to sit down on Christmas night with all my past issues of Sew Beautiful and Creative needle and search for Easter inspiration. Now I'm a grandma to a precious 8 month baby girl and going to pull out that old Chery Williams bishop pattern and get busy. Things have changed. Now I search the web for that inspiration. Patterns and plates look the same,there are a few new designers. My searching brought me to your blog. 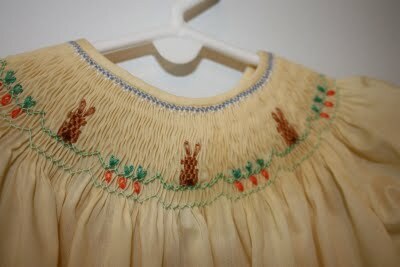 I found your post about attaching binding to the bishop neckline and love the bunny plate on blue microcheck. Can you share where the plate is from. I have searched, but can't find it. Thank for your help. Thank you for your kind words. 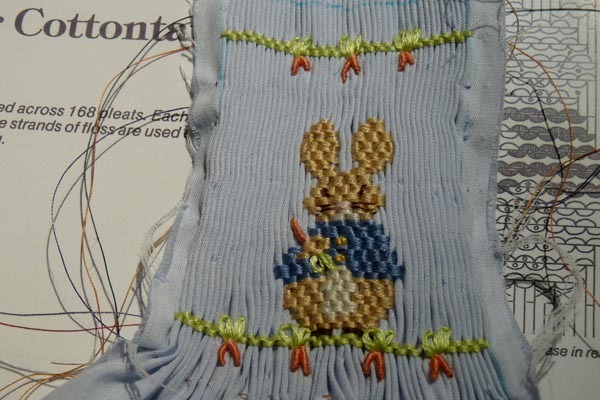 THe bunny plate on that aqua bishop is from Creative Needle Jan 2008. Somebunny Loves Me is the name of the plate.